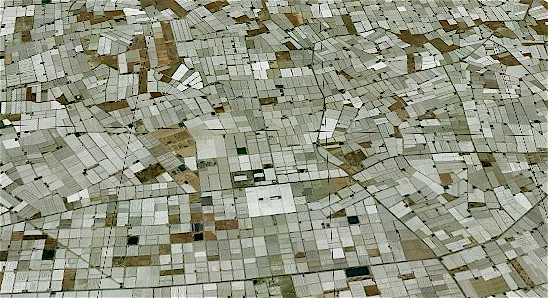 There are an estimated 30,000 hectares of greenhouses in Almería, southern Spain, the largest concentration in the world. Over 2.7 million tonnes of produce are grown under polythene each year, accounting for over €1.2 billion in economic activity, and the growth of an associated complex industrial and service sector. The diagram below shows the interrelationships between greenhouse agriculture in Almería and the growing industrial and service sector. The industrial sector includes a large agrochemical cluster and most of the world vegetable seed companies have located experimental stations in the region. Seed production has increased dramatically in the past 25 years, from approximately 600,000 metric tons in 1975 to 2.7 million metric tons in 1997-98, with production worth nearly 1,000 million euros in 2002. The agribusiness cluster has generated a series of external economies that have reduced production costs, and created an "industrial atmosphere" to facilitate innovation and the spread of knowledge and expertise. Almería has become an international reference point for agribusiness production systems that is increasingly difficult for potential competitors to imitate. Farming in Almería has many of the characteristics of agribusinesses that operate on an industrial scale. It is energy-intensive (to pump underground water, for seawater desalination and to operate complex process monitoring equipment). It involves a high level of technological development (computer-controlled fertiliser systems, the development of hydroponics, the use of selected high productivity seeds etc.). There is a tendency to standardisation of ranges and qualities of products. The relative lack of natural resources essential for agricultural development (water, humidity, soil with a minimum organic content). Overexploitation of underground water sources. A high turnover of the immigrant workforce.